Here's some photos from the race. Do you have more photos? Send a link to your photo gallery and we'll post it here. Send a mail to: Hillside.cycling@gmail.com. 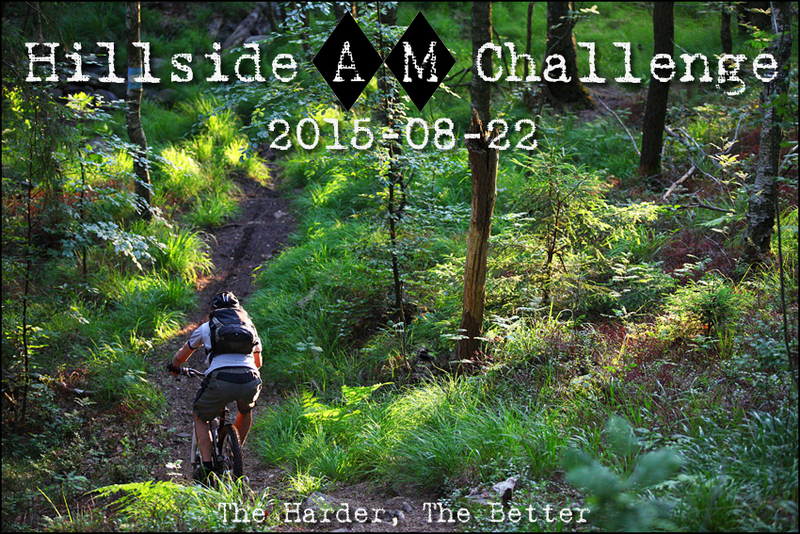 Prepare for Launch: The years toughest MTB race is Saturday, August 22nd at 11:00. Attachments to PM: Map over access roads,map over start- & finish area and Marshalls/First Aid helpers. In the magazine "Utemagasinet Träna" you can read about some of the trails. Link to the article "Stigmeckat i Göteborg": Utemagasinet Träna nr 1 2014. 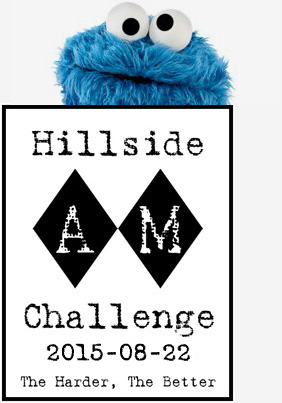 Last years information (photos, videos & results) can be found here: Hillside AM Challenge 2014. Refund of the entry fee; until 2 weeks prior to race day - Friday 7th August. After this, it's up to the participant to sell his/her entry. Name changes have to be reported to us ASAP. Here's the preliminary participant list. If you don’t get a spot, we’ll give you a reserve list number. If spots open up, first on the reserve list takes it. Late entries are possible only if there are enough vacant places on race day. Register at 10.00 - 10.30 in the race office (Domherren). Late entry registration fee: 400 kr, cash only. INFO: Vacant places are released by number plates that are not picked up. Number plates have to be picked up no later than 10.00 am on the race day at the race office. Which means that we don't sell more entries than we have number plates for. 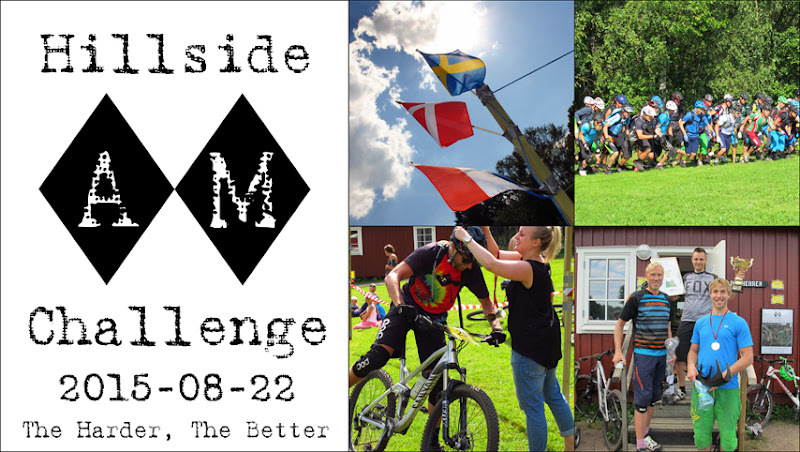 The race starts with a section of the marked MTB course and passes Brudaremossen followed by a tough climb up to Västra Långvattnet where you ride on the exposed granite along the lake. Turn left along the backside of the rocks for one more climb back to the top. You now approach one of the highlights: Getryggen. After descending the new downhill section, you will continue on the classic trail Thin Lizzy. A long technical climb is waiting for you there on Leopold’s Secret Trail. After passing Blacktjärn it’s time for the next challenge: climb Blueberry Trail. Blueberry is followed up by Lingonberry Trail taking you to the Golf Course Loop which winds its way up to the top of Höga Bergen (kalhygget). From the top of kalhygget you’ll take a right toward Bohusleden where the rocky descent is waiting for you. Continue a short bit on Bohusleden before turning right to make a little loop over two creeks. Now it’s time for the trail with the fluorescent green moss and the soft pine needles. When you leave the enchanted woods you are met by the mythical Black Beast trail, which starts with a long climb and ends with a steep descent. The next challenge is the Chicane, which to spite it’s name, can be ridden straight through. After a bit more climbing, you reach the Ravine where the trail becomes a steep and narrow descent. As icing on the cake, there is a narrow footbridge waiting for you at the bottom. From here you’ll ride the gravel to Badger Trail and then it’s just a kilometer left till the finish and just one last piece of singletrack before you reach Skatås. Sprint the last couple of hundred meters and you’ve earned yourself a treat! Course map, click to enlarge. Elevation profile. 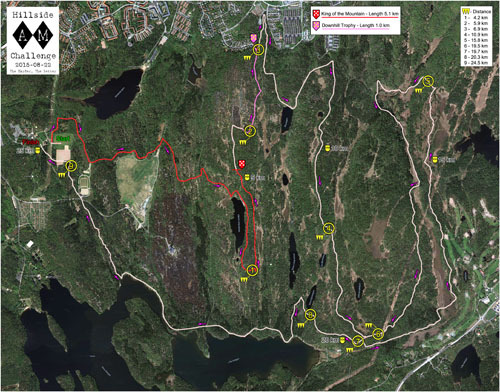 Cumulative elevation gain: 600 m.
The course in both Google Maps and GPX format. Participation is at your own risk. You are responsible for yourself and your bike while out on the course. If you want insurance, you’ll have to organize it yourself. Any non-motorized cycle is permitted, but no swapping of bikes during the race. Helmet mandatory. Elbow and knee pads recommended. If you need to stop, do not block the trail for others. Make it easy for others to pass. If you hear “On Your Left!” from behind you, keep to the right and be prepared to allow a pass at the first convenient spot. You need to be 100% self-sufficient while on the course. There is no hydration, energy, mechanical or medical support provided. We recommend a hydration pack with everything you might need, including water, energy, pump, tube, tools, cellphone and first aid kit. If you see someone injured, you should stop to check on them and help if necessary. For serious accident, call 112 immediately. New for this year: All participants get a well deserved medal at the finish line. The winners of Men's and Women's race gets a grand trophy and bubbly! 1st, 2nd and 3rd in both Mens and Womens. Climb prizes for Men and Women. And one downhill prize that is open for everyone. There will also be a SWAG giveaway. The prize list will be updated soon. Race bibs (number plates) along with snack coupons can be picked up the week before the race. Number plates have to be picked up no later than 10.00 am on the race day at the race office. Show your snack coupon in the start area between 9:00 and 10:45 to get your indispensable energy bar. Le Mans start! All bikes are placed in position 15 minutes before start; riders run to their bikes; men and women together. Two marshals will be guarding the bikes. Timing starts at 11:00. If you’re shooting for one of the top places, you must use Strava. This also applies to the downhill prize where the fastest (not the first) down Getryggen and Thin Lizzy wins. The Climb prize, however, goes to the first man and woman up Getryggen, as recorded by a marshal. We recommend that everyone uses Strava which will serve as the data for the preliminary results. You can use it to compare your times with other riders over the stages we’ve designated. A finish line camera will help sort out the final results. We’ll be serving snacks in the finish area. The ceremony will be held in the finish area after the race at 15.00. Locker rooms and showers are available at Skatås motionscentral for 40 SEK. There is a large paid parking lot adjacent to motionscentralen, see map. 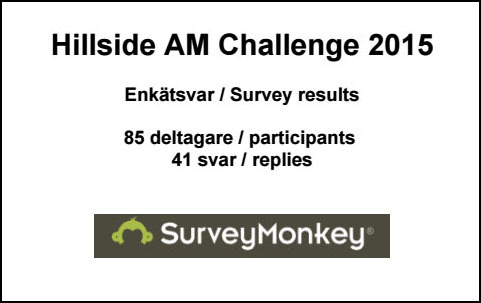 Maximum 100 participants. 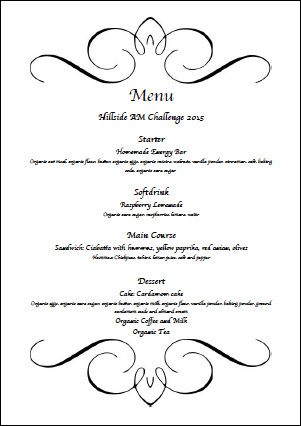 Registration fee is 400 SEK which includes the massive homemade energy bar. Homemade raspberry lemonade, sandwiches and of course homemade cookies after the race. Two big Lezyne Alloy Dirt Floor Drive floor pumps! Mudhugger contributes with two pairs of effective mudguards. Mudhugger rips up the rule book on mudguards letting you rip down the trails.